Having been in business for over 90 years, Saylor-Beall air compressors truly have generations of experience behind their design and construction. Able to meet the specifications of the most exacting applications, Saylor-Beall air compressors are as versatile as they are reliable and durable. This experience and dedication to quality has led A & W Compressor to become an authorized distributor for this reputable manufacturer, and we are proud to provide these compressors to our valued customers in Tennessee. Whether you’re searching for a pressure lubricated piston compressor for a heavy industrial use, or you need a splash lubricated model for your auto body shop, A & W Compressor can provide it at an affordable price and with personal, professional customer service. Regardless of the model or horsepower you choose, you can be sure that all our Saylor-Beall air compressors are reliable, resilient, and able to perform under the harshest conditions, when you need them most. 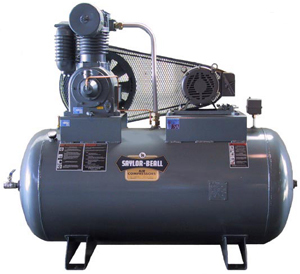 Call or e-mail A & W Compressor today for more information on Saylor-Beall air compressors for your company in Nashville, Johnson City, or anywhere in between. We’ll be happy to serve you from any of our three locations in Tennessee.